Ewa Cybulska (Marion Cotillard) and her sister sail to New York from their native Poland in search of a new start and the American dream. When they reach Ellis Island, doctors discover that Magda (Angela Sarafyan) is ill, and the two women are separated. Ewa is released onto the mean streets of Manhattan and quickly falls prey to Bruno (Joaquin Phoenix), a charming but wicked man who takes her in and forces her into prostitution. The arrival of Orlando (Jeremy Renner) – a dashing stage magician who is also Bruno's cousin – restores her self-belief and hopes for a brighter future, becoming her only chance to escape the nightmare in which she finds herself. The Statue of Liberty stands proud and tall in the distance -- a shining beacon of hope and a towering symbol for the American Dream. But rather than meet her inspiring gaze before our eyes… she has her back to us. The dream she represents so close, yet still not quite in our grasp. It is this simple yet thematically deep image that director James Gray chooses to open 'The Immigrant' with, perfectly setting the stage for the tragically lyrical story to follow. Old fashioned but artistically crafted, the stirring drama chronicles the hardships of suffering and the redemptive power of forgiveness -- shining a sepia-hued light on the lost souls of yesteryear. 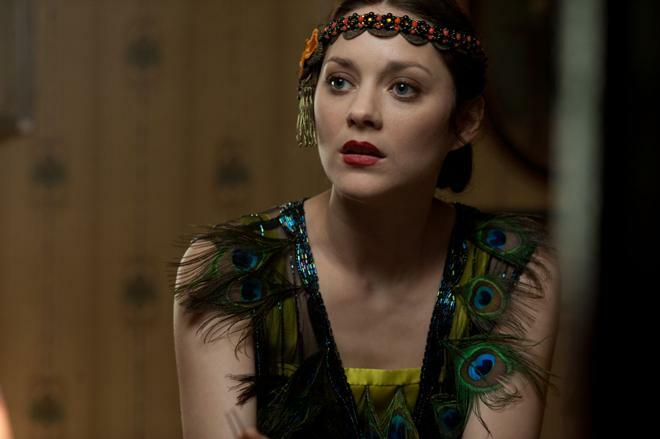 Set in 1921, the film follows a Polish immigrant named Ewa (Marion Cotillard). After arriving at Ellis Island in New York, Ewa is separated from her sick sister and is told that the relatives she was planning to live with are no longer at their given address. With nowhere to turn, the lost woman is scooped up by Bruno (Joaquin Phoenix), the proprietor of a burlesque show. Coerced into working for the dubious man, she sells herself in order to survive. But when Bruno's kindly cousin, Emil (Jeremy Renner), enters the picture, Ewa finds a possible solution to her struggles. Loosely paying homage to some of his own family history, director James Gray weaves a classic melodrama concerned with the dire hardships tied to early 20th Century immigration. From the moment she gets off the boat from Poland, Ewa is thrust into a climate of exploitation, and Gray uses her escalating conflicts to create an affecting tale about survival and redemption within a world that seemingly has no place for her. And though titled 'The Immigrant,' the movie could have just as easily been called 'The Immigrants,' as both Bruno and Emil join Ewa to help paint a larger portrait of outsider adversity. Together, the trio form a contentious love triangle of sorts, with Phoenix's Bruno taking the central antagonist role. Dangerously possessive but not entirely cruel, for much of the runtime it's hard to really pin down the character, with both the performer and director deliberately hiding deeper layers beneath an angry exterior. While the kindly magician Emil is ostensibly cast in the savior role, these designations become far less cut and dry as the narrative evolves, and Bruno's potentially redeeming or potentially damning qualities end up fueling most of the drama in the third act. Of course, this is really Ewa's story, and thankfully the determined woman is not simply defined by the men in her life. Vulnerable yet far from a mere victim, through Cotillard's beautiful performance the character proves to be a true survivor, resolved to hold onto her self-worth and reunite with her sister even in the face of dehumanizing acts. Yet, at the same time, she is not above morally loose methods in order to keep afloat, helping to expand upon Gray's multifaceted characterizations. And no matter how flawed these protagonists and antagonists become, we still feel aching sympathy them. It's always clear that the director and actors truly care for their characters, and so, we can't help but care as well. This same loving detail is infused into every frame of the film, resulting in a visually striking period piece that perfectly evokes its bygone era. Using photographs and paintings as a reference, Gray creates an appropriately stylized yet still very authentic vision of the past. Lighting designs attempt to mimic the conditions of the 20s, enhancing the mood through a faintly golden-hue, and handsomely crafted compositions help to extend the old fashioned feel. The movie's final image is particularly striking, and though I'll try not to give too much away, it's actually one of my favorite shots from any film released last year, using reflections (with the aid of computers) to place two characters together in the frame as they simultaneously part ways in different directions. Through his deliberately operatic narrative, James Gray expertly crafts an old-fashioned drama that transports audiences into a sepia-toned world full of tragedy and healing. Though elements of the script might veer too broad and melodramatic for some, this is actually a deceptively nuanced film with themes and characterizations that end up being far deeper than they initially appear. With its bittersweet examination of the American Dream, 'The Immigrant' carefully balances hope and despair, keeping Lady Liberty's promise fully alive but at a distance -- casting the characters under her gently receding shadow, forever striving to reach the light. 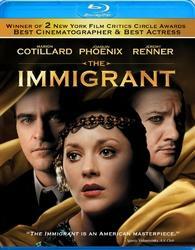 Starz/Anchor Bay brings 'The Immigrant' to Blu-ray on a single BD-50 disc that comes housed inside a keepcase. After some skippable trailers, the disc transitions to a traditional menu screen. The packaging indicates the release is Region A coded. The movie is provided with a 1080p/AVC MPEG-4 transfer in the 2.40:1 aspect ratio. Despite some minor hiccups, this is a beautiful picture with a distinct golden-hued style. Shot on 35mm film, the source is pristine with a healthy layer of natural grain, giving the image a richly filmic quality that fits the period piece setting perfectly. Clarity is strong, with a pleasing level of fine detail and texture in settings and characters, revealing all of the anguish and turmoil in Marion Cotillard and Joaquin Phoenix's tormented faces. The color palette sticks to an appropriately sepia hue that emphasizes a yellow/brown cast, evoking the 1920s atmosphere. A few specific scenes also feature pleasing splashes of color, including a few sequences set in a burlesque show. Whites are bright, adding a slightly dreamy quality, and blacks are mostly solid. With that said, dark scenes can look a tad faded and slightly blue. Likewise, there is some minor compression visible during fades. Though the chosen aesthetic can be tad dull compared to many modern, oversaturated efforts, the style is artistically strong and the cinematography is gorgeous. The film is presented with an English DTS-HD MA 5.1 track along with English, English SDH and Spanish subtitles. With immersive ambiance and design work, the mix effectively conveys the 1920s New York setting. Speech is clear and full throughout with no technical issues. From crowded Ellis Island locations to noisy apartments and rowdy clubs, the movie offers a natural and enveloping sense of space and character, spreading sounds (chatter, birds, city ambiance) around the room with natural directionality. Though relatively modest, the surround use is effective and there is a pleasing level of authenticity to the effects work that really helps to breathe life into the time period. The movie's powerful score also fills the speakers, and though low frequencies aren't particularly notable, dynamic range is wide and distortion free. 'The Immigrant' comes to Blu-ray with a very elegant mix, enhancing the movie's old-fashioned tone and setting. Feature Commentary with Writer/Director James Gray – Gray provides an engaging discussion about the movie and his approach to directing. The filmmaker touches upon the melodramatic style, historical accuracy, locations, accomplishing shots, themes, casting, improvisations, and the story's autobiographical nature. In addition, Gray also shares numerous thoughts on film and art in general, and though I don't agree with all of his conclusions, he offers a very well-spoken and perceptive track filled with lots of great production info and filmmaking insights. The Visual Inspiration of The Immigrant (HD, 3 min) – Provided in 1080p with Dolby Digital 2.0 sound, this featurette focuses on period photographs and paintings that were used as a visual reference and influence for the movie. Theatrical Trailer (HD, 2 min) – The film's trailer is included in 1080p with Dolby Digital 2.0 audio. 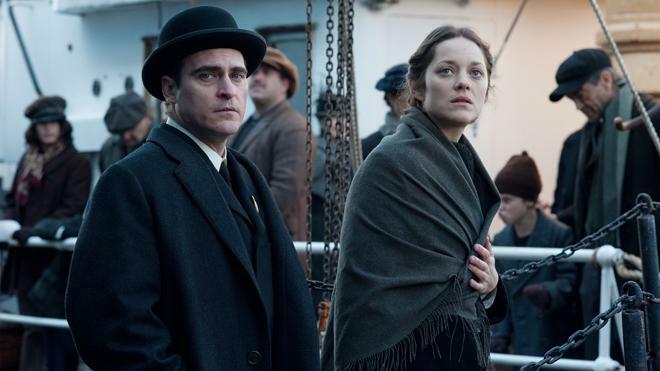 Director James Gray's 'The Immigrant' is a beautifully crafted drama steeped in an operatic sense of tragedy and hope. The 1920s setting is perfectly realized and the layered performances are simply heartbreaking. On the technical front, the video and audio are both strong, respectfully rendering the film's impressive style. Though supplements are a bit light, the included commentary and featurette are very worthwhile. As long as you can embrace the movie's classically melodramatic elements, this is a powerful and affecting motion picture. Recommended.